Finals are hard! 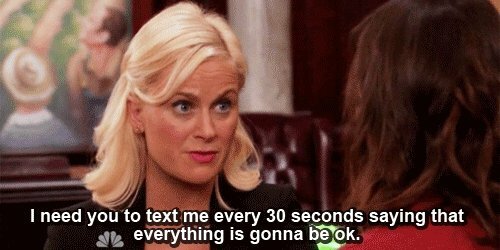 But you CAN do it with a little help and advice from your friendly neighborhood parks woman, Leslie Knope! Your friends have got your back. Make sure you send each other really funny Vines and quizzes that tell you "What type of Macaroni" you are for sanity reasons. Schedule library meet-ups so you can suffer through studying together and have a hand to hold when the tears come. Expect some angry calls from your parents. Okay, so your grades may be a Britney circa 2007 on a scale of Kim Kardashian to Beyonce, but what can you do?! College is HARD! And you mayyyy not have applied yourself as much this semester. Maybe your finals will bring your grades up.... hahahha.... a kid can dream! But just expect some angry calls from your parentals and handle them with poise and grace, because you'll be back home living with them for the summer and you want them to feed you. Just simply be super chill all the time. The chiller you are the less sad you will be when you get your final grades back! Ways to stay chill: eat queso, watch cat videos, retail therapy, and call your mom. Remember it's just a test (that determines your future) but it's just a test!! Fergie was wrong: sometimes big girls DO cry. Cry it out. Just do it, fam. Finals make us cry and that's just a fact of life. We get overwhelmed because we're working, taking tests, attempting a social life, forgetting to pay our rent, and feeding our dog 6 times a day because we can't exactly remember if we already fed her and even if you're hungry she shouldn't be. Public crying is fully allowed during finals week. Be sure to encourage your friends. Remember you're not the only one who feels the soul crushing pain of finals, so check up on your friends. Make sure they know that they are powerful muskoxes that can do the impossible-- even a physics final. Be there with open arms and Andy's when their Art History final was way too hard for Art History. It's a fact: finals require more sleep. High stress and low self-esteem are a recipe for disaster and the only possible cure is naps on naps on naps. Wear your comfy clothes to your finals so when you're finished you can do the quick turn around and jump into the warm embrace that is your bed. We just feel obligated to tell you this for some reason. This isn't even that important. And when those are horrible and disgusting return to what you know. DESSERT. This is more like it. EAT SOME CAKE. Y'all deserve it. We pinky swear that waffles loaded up with whipped cream will make you forget that you were runnin' through the six with your woes (like sad woes) earlier that day. Fill the cracks of your heart with peanut butter. Finals week are totally an excuse to eat your feelings: never forget that. And when you're all done and it's finally Summer-- bask in your freedom! YOU'RE FREE! Shout it from the rooftops that you're FREE! (I mean besides work, summer school, and your other responsibilities) YOU'RE TOTALLY FREE! You can finally think about everything besides mitochondria being the powerhouse of the cell and start thinking about tans, concerts, and NETFLIX! Happy Finals! We know you can do it!